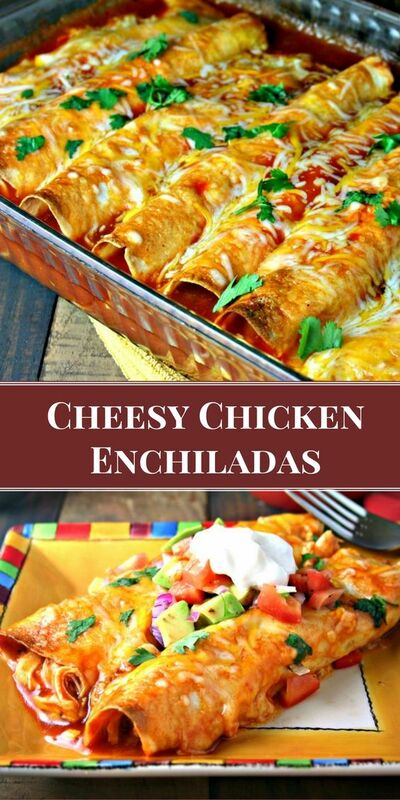 Loaded with chicken and cheese, these EASY Cheesy Chicken Enchiladas come out of the oven with a slight crunch, which makes them a little extra special. Pour enchilada sauce into a deep skillet and add the minced garlic; heat to boiling. Season the chicken breasts with salt and pepper on both sides and add to the skillet, nestling into the sauce. Reduce to low heat and cover. Cook for 15-20 minutes or until the chicken is cooked through. Remove the chicken from the sauce and let the chicken and the sauce cool slightly. Use two forks to shred the chicken (pierce the chicken with one fork and hold it steady while slowly scraping the other fork, prongs faced backwards, away from the other fork). Lightly coat the bottom of a 9-inch x 13-inch baking dish with cooking spray and set aside. Add chicken, 3/4 cup reserved enchilada sauce, and 1 cup cheese to a large bowl. Add cilantro (if desired) and stir gently to combine. Warm the tortillas wrapped in a damp cloth or paper towel in the microwave on high for 20-30 seconds. Assemble the enchiladas by spooning a heaping 1/3 cup of the chicken mixture along the center of the tortilla. Roll the tortilla around the filling and place into the baking dish, seam-side down. Repeat with remaining tortillas. Brush the tops of the enchiladas with a small amount of olive oil. Place the dish into the oven and bake uncovered for 8-10 minutes or until the tortillas begin to turn golden. Reduce the oven temperature to 400 degrees. Remove the baking dish from the oven and pour the remaining sauce over the enchiladas and sprinkle with the remaining cheese over the sauce. Lightly cover with aluminum foil and return to the oven for 20 minutes. Carefully remove foil and bake uncovered for an additional 5-10 minutes or until the cheese is golden. Let stand 5-10 minutes prior to serving. Garnish with cilantro and serve with sour cream or salsa, if desired.